Charged Water is filtered water that has been “charged” with energy boosting, immune enhancing and digestive stimulating nutrients. The easiest thing you can do to improve digestion, detoxification and weight control is to drink charged water on a regular basis. The water absorbs vital nutrients from the added herbs, fruits and veggies and delivers them to your system without creating digestive stress. If fact, it is quite healing to the digestive system. It requires little action from digestive organs and instead supplies co-factors needed to stimulate function. I typically recommend specific combinations to clients to help address their specific needs. However, you cannot go wrong picking any or all of the following ingredients. I also recommend following what is in season. Strawberries in the spring, watermelon in the summer, apple slices in the fall and pomegranates in the winter are all great seasonal options. Himalayan Crystal Salt is by far the purest salt available on earth. It is uncontaminated by any toxins or pollutants. Not all salts are created equal and this salt should not be confused with the disease causing table salt. Today’s common table salt is actually 97.5% sodium chloride and 2.5% dangerous chemicals such as fluoride, calcium carbonate, magnesium carbonate, and aluminum hydroxide which are often added to improve the ability of table salt to pour. Read more about the benefits of Himalayan Salt. Basil provides a healthy dose of Vitamin K which is essential for blood clotting. Basil also provides Iron, Calcium, Vitamin A, Manganese, Magnesium, Vitamin C and Potassium. Basil contains DNA-protecting flavonoids, has anti-bacterial properties, combats inflammation, and promotes cardiovascular health. Mint is high in vitamins A, C and folate. It is also high in the minerals calcium, copper, iron, magnesium, manganese and zinc. High in fiber, mint is well known for its ability to reduce the severity of irritable bowel syndrome by relieving symptoms of gas, bloating, abdominal discomfort and diarrhea or constipation. Rosemary provides Calcium, Copper, Folate, Iron, Magnesium, Manganese, Potassium, Vitamin A, Vitamin B6, and Vitamin C.
Rosemary’s antioxidant content is known to help prevent cataracts. The natural acids present in rosemary help in protecting the body’s cells and DNA from free radical damage. Rosemary stimulates liver enzymes, which help inactivate estrogen hormones which can cause breast cancer. Rosemary extract helps prevent age-related skin damage such as wrinkles. Rosemary encourages enzymes, which flush harmful toxins out of the liver and the body. When consumed on a daily basis, rosemary extract can improve kidney functions, increase urine flow and preserve essential minerals such as sodium, and potassium. Sage has anti-microbial and anti-bacterial properties and is an excellent natural remedy for fungal, viral, and bacterial infections. Sage also has the ability to provide relief from acidity and aid in digestion of fatty and hard to digest foods. Sage can actually improve brain function and has anti-oxidant qualities. Sage also provides anti-inflammatory components including Beta Carotene, Folate and Vitamin K plus the nutrients: Calcium, Copper, Magnesium, Manganese, Thiamin, Vitamin B6, Vitamin C, and Vitamin E.
Organic Lemons & Limes: Known to improve liver function, all citrus and sour fruits contain malic acid. Malic Acid found in sour fruits like apples, lemons, limes and grapefruits assists the body in breaking down fat thus thought to prevent the formation of gall stones. Though citrus juice is thought to be acid, the effect on the digestive system is alkalizing making it an important digestive aid. Hesperidin is a potent bioflavonoid found in the pulps and rinds of citrus fruits. Hesperidin is useful in dealing with the viruses that cause herpes, the flu, and certain respiratory ailments. Hesperidin fights allergic reactions by blocking the release of histamine. It has an alkalizing effect on the system which helps reduce bloating and edema like symptoms. 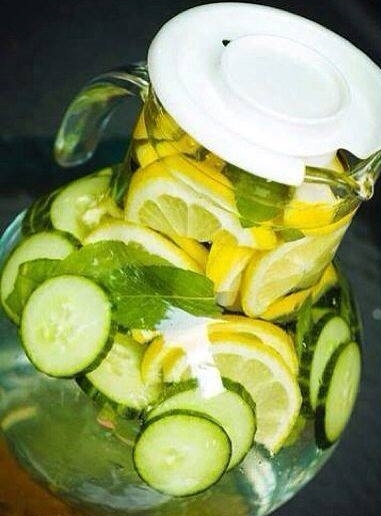 Cucumbers are known as one the best natural kidney cleansers. They are rich in B vitamins and are highly re-hydrating. They are known to improve diabetes, bad breath, joint and arthritis pain and gout. “I’m so glad that Pam is back in the area! We revisited two weeks ago to discuss my nutrition plan. After two weeks, my results are improving and I feel WONDERFUL! Just drinking the charged water first really made a difference and now incorporating her recipes has significantly made a change. I can’t wait until our next meeting to see how I’ve progressed!! !” T.V. This entry was posted on May 7, 2015 by thrivecoach12 in Drink Recipes and tagged Detox, Digestive Stimulating Recipe, Energy Recipe, Fairview Heights Nutrition, Immune Enhancing Recipe, Pam Faulkner Recipe, Thrive Coach 12 Recipes, Weight Control. This information is for educational purposes only and is not meant in any way to diagnose, treat or interfere with prescribed medical care.